3/4" Side Outlet 90s, aka, "pvc corners." Slip socket on TWO ports, one port THREADED. Used many for irrigation projects, but could be used for a construction project as well. 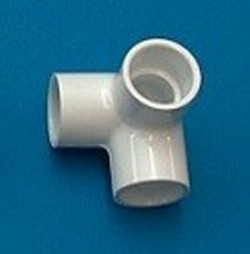 NSF rated fitting, can also be used for plumbing projects. Full flow through. Made in the U.S.A.